The Model AX503 offers dual 30V outputs with the ability to display both voltage and current for each output. Additionally, the Model AX503 offers a 5V blind output which is adjustable from 2.7 to 5.5V. Dual 30V outputs can be connected in series to provide double the output voltage up to 60V, or they can be connected in parallel providing double the current output up to 5A. The Model AX503 offers a unique master/slave tracking arrangement whereby the ratio between master and slave can be setup on the fly as needed during the test. Adjusting the master voltage causes the slave to track. Adjusting the slave voltage causes the ratio from master to slave to change accordingly. It offers a Coarse and Fine voltage adjustment as well as current limiting adjustment. 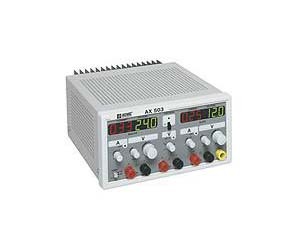 The Model AX503 is built to provide many years of reliable, precise, easy-to-use operation and will be a welcome addition to any lab, test bench or production line.